If there's one thing that feels good it's sleeping on the man's dime and not getting fired for it. And while some lock their office doors and play audio of themselves on the phone or opt to sleep in the trunk of their car, I'm more of a traditionalist: passed out on the handicapped commode in the bathroom with my head between my legs. Nobody ever gives me a hard time because nobody ever wants to hear about my bowel trouble. I mean, I'll tell you, but not if you want to eat today or tomorrow or the next day. 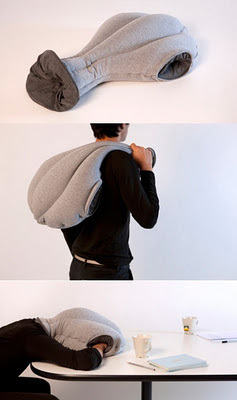 Enter the Ostrich, a pillow thingy designed to mimic the ostrich's 'head in the sand' style of catching bees. "You mean Z's?" No Sherlock, I'm pretty sure they eat bees. OSTRICH offers a micro environment in which to take a warm and comfortable power nap at ease. It is neither a pillow nor a cushion, nor a bed, nor a garment, but a bit of each at the same time. Its soothing cave-like interior shelters and isolates our head and hands (mind, senses and body) for a few minutes, without needing to leave our desk. Plus it makes it really uncomfortable to breathe, so you'll probably wake up thinking you were buried alive. And speaking of being buried alive: once in my misguided youth, I actually buried a worm alive. "Yeaaaaaaah, it probably lived." No, you don't understand -- it was at sea. And that was after I'd impaled him on a hook but right before a a fish ate him OH THE HUMANITY.